Kayode Odejayi.' Picture Bruce Rollinson. Guiseley held on for an excellent 1-1 draw at Chester in National North yesterday after having a man sent off in the first half. 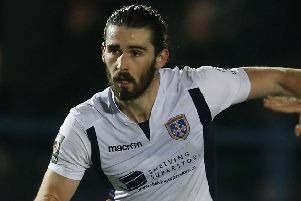 Before kick-off Guiseley announced two loan signings in Josh Langley and George Cantrill from Southport and Sheffield United respectively, both made the starting XI in this match. Guiseley almost took the lead early on, good work by Cantrill saw him thread a pass through to Rowan Liburd, he was one on one but saw his curled effort from just outside the area go just wide. The hosts thought they would take the lead when their debutant Sean McAllister crossed for Craig Mahon, it looked like he would have a free header but Langley was able to get in a vital interception and got the ball out of play. Kayode Odejayi then made it three goals for 2019 as he headed in a fine Andy Halls cross into the top right-hand corner sending the away fans into a frenzy. The first 30 minutes of this game was played at a high-tempo with end-to-end chances. With moments to go until half-time, Guiseley went down to 10 men when Halls was shown a straight red card. This would change the game, the home would soon be in the ascendency, with ex-Guiseley forward Anthony Dudley scoring with a free header, his effort was just able to beat Marcus Dewhurst. Chester would then be on the attack throughout the rest of the game, with Dan Mooney seeing a fine driving effort saved. A resolute defensive display by Guiseley saw them hold onto a hard-fought point. The result leaves the Lions five points off the relegation zone with two games in hand ahead of their match at leaders Chorley on Saturday. After the draw Guiseley joint-manager and ex-Chester boss Marcus Bignot said: “First of all it is a good point for us on the road against a tough side. Bradford Park Avenue’s title challenge continues to stall after equalling their worst run of consecutive league defeats since September 2016. Mark Bower’s second-placed side suffered a third straight loss after going down 3-2 at home to relegation-threatened FC United of Manchester, meaning the gap to front-runners Chorley stretched to six points. The hosts looked in control when Oli Johnson found the bottom corner through a crowded penalty box after Lewis Knight had earlier rattled the frame of the goal. But former Avenue forward Chris Sharp levelled on the stroke of half-time when he cut in from the left and fired home from the edge of the box. United then turned the game on its head with two quickfire goals just past the hour mark. First, Jack Banister spectacularly found the top corner, just two minutes before Kurt Willoughby netted following a positive raid down the left wing. In a see-saw encounter, Knight then replied with another terrific finish into the top corner, but Bradford were denied a share of the spoils when Nicky Wroe’s deflected effort struck the crossbar.